Without a doubt, menopausal women who suffer from panic disorder, frequent panic attacks, may feel as if this is just another hurdle they have to overcome on their transition out of fertile years. While conventional therapy is often suggested as the first line of action, there are alternative panic therapy options that are just as viable. 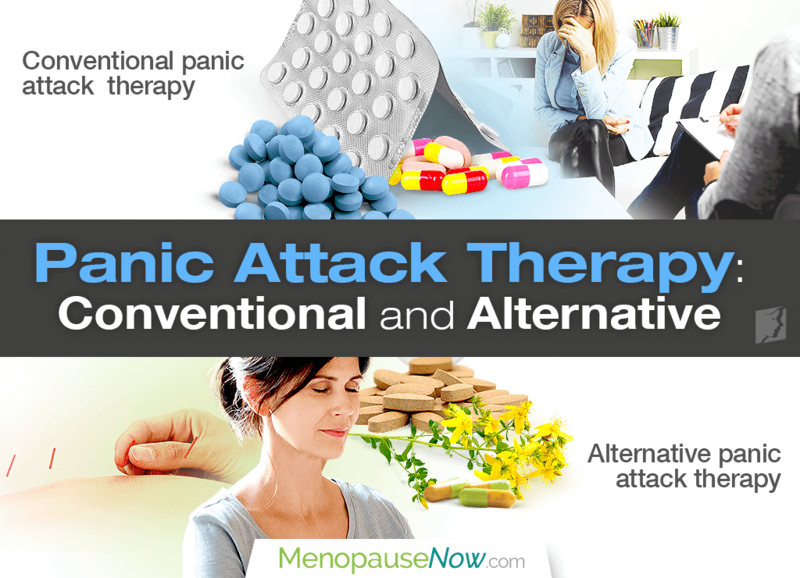 Click here to learn all about conventional and alternative panic attack therapies in order to make the best decision for your mental health during menopause. Cognitive behavioral therapy, a form of psychotherapy, can help women learn through their personal experience to replace fearful responses to stimuli with peaceful ones and to realize that their episodes are not harmful by slowly recreating symptoms in a safe, repetitive manner. When symptoms no longer make the women feel threatened, panic attacks will begin to reside. Depending upon certain factors - such as preference, severity of panic disorder, or history - women who pursue psychotherapy may wish to accompany it with medications. Selective serotonin reuptake inhibitors (SSRIs). It is the main type of medications, also known as antidepressants, that is highly recommended for panic attack treatments. Serotonin and norepinephrine reuptake inhibitors (SNRIs). This is another class of antidepressants traditionally used to treat panic attacks with a slightly different mechanism of action. Benzodiazepines. These sedatives are considered less effective than antidepressants and cognitive behavioral therapy. They can cause dependence or interact with other drugs. If the first type of medication is ineffective, your doctor may switch to another type or combine them to boost effectiveness. Also, keep in mind that medications have associated side effects. Acupuncture has been scientifically proven to mimic the mechanism of various anti-anxiety and anti-depressive medications by increasing amounts of serotonin and norepinephrine available to the brain, thus making it useful in treating anxiety disorders. Also, the practice doesn't lead to the myriad of side effects experienced with many drugs. Certain stress management and relaxation techniques can prove helpful as therapy for panic disorder attacks. For instance, meditation and deep breathing exercises can help lower stress hormone levels, relax tense muscles, and bring you to the present, focusing on the breath and nothing else. Phytoestrogenic herbal supplements. These herbal supplements, like St. John's wort, contain plant-based estrogens that help fill the hormonal gap in the body, thus alleviating menopause symptoms, including panic attacks. They are not recommended for long-term use as introducing outside hormones into the body can cause it to produce less of its own hormones. Hormone-regulating supplements. These supplements, like Macafem, nourish the pituitary and endocrine glands, encouraging them to produce their own hormones, thus resolving the hormonal imbalance at fault. They can be considered one of the safest herbal supplements as they do not introduce outside hormones into the body and can be taken long-term if need be. In sum, menopausal women suffering from bouts of anxiety and panic attacks have more than just conventional panic attack therapies available. Aside from psychotherapy and medications, they are encouraged to look into alternative options of acupuncture, stress-relief methods, and herbal supplements. When paired with wholesome lifestyle changes and other panic disorder treatments, women can overcome their attacks happily and healthily. You can put your panic attacks at bay with several natural remedies once and for all. Click here to learn more. Panic attacks are characterized by overwhelming fearful and anxious feelings. Discover if medications are the solution to your panic attacks.